Hire Gauge shows how a typical business can save nearly $32,000 while reaping critical workplace diversity and marketplace returns. Hire Gauge demonstrates all the reasons—financial and otherwise—that make hiring people with disabilities a good business decision, says Barbara Otto, CEO of Health & Disability Advocates. Think Beyond the Label, a leading public-private partnership that works to increase employment for people with disabilities, today rolled out Hire Gauge, an online resource that calculates the financial return on investment and other benefits of hiring a person with a disability. ich, for a typical large business, can reach $31,800 per hire. At the same time, Hire Gauge sums up the wide range of workplace and marketplace benefits that businesses also reap when they recruit, hire and retain a qualified job seeker with a disability, including veterans. “Hire Gauge demonstrates all the reasons—financial and otherwise—that make hiring people with disabilities a good business decision,” says Barbara Otto, CEO of Health & Disability Advocates, the Chicago-based policy and advocacy organization that operates the Think Beyond the Label partnership. “Apart from monetary advantages like tax incentives and lower recruiting costs, businesses that practice inclusive hiring will boost workplace diversity, as well as improve the way they think, operate, innovate, and grow,” she says. 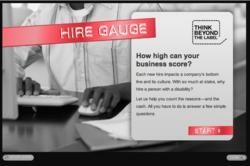 Hire Gauge, which can be found athttp://www.thinkbeyondthelabel.com, asks users a series of questions about their business and disability employment hiring practices, and calculates the monetary incentives for which the business is eligible to arrive at a total estimated number. Think Beyond the Label created Hire Gauge using data from human resource and diversity organizations, federal and state government agencies, and case studies from companies on their disability hiring efforts. The results are intended to guide and provide support to hiring managers in their ongoing diversity and inclusion programs, as well as to encourage more businesses to broaden their recruitment efforts to include people with disabilities. “By presenting multiple sources of research into one package, businesses can get, and share with others, an instantaneous, factual look at how inclusive hiring can and will positively impact their bottom line,” adds Otto. Think Beyond the Label is a private-public partnership that helps businesses and the public workforce system more effectively recruit, hire and retain job seekers with disabilities across 50 states. Our partnership spans state health and human service and employment agencies; businesses; and Health & Disability Advocates, a national nonprofit organization that manages the Think Beyond the Label partnership. For more information please go tohttp://www.thinkbeyondthelabel.com.